Remington New Model Army Revolver made c. 1863 - 1875. It saw use in the American West, both in its original percussion configuration and as a metallic cartridge conversion, as well as around the world. The Remington is a single-action, six-shot, percussion revolver produced by E. Remington & Sons, Ilion, N.Y., based on the Fordyce Beals patent of September 14, 1858 (Patent 21,478). The Remington Army revolver is large-framed, in .44 caliber, with an 8-inch barrel length. 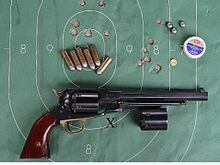 The Remington Navy revolver is slightly smaller framed than the Army, and in .36 caliber with a 7.375 inch [Beals Navy 7.5 inch] barrel length. There were three progressive models made; the Remington-Beals Army & Navy (1860–1862), the 1861 Army & Navy (1862–1863), and the New Model Army & Navy (1863–1875). The three models are nearly identical in size and appearance. Subtle but noticeable differences in hammers, loading levers, and cylinders help identify each model. 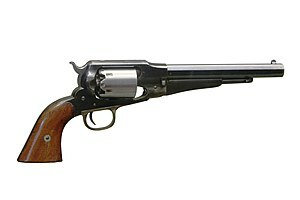 The 1861 Remington actually transitioned into New Model appearance by late 1862, slowly transforming throughout 1862, due to continual improvement suggestions from the U. S. Ordnance Department. Remington percussion revolvers are very accurate and capable of considerable power with muzzle velocities in the range of 550 to 1286+ feet-per-second, depending upon the charge loaded by the shooter. Combustible cartridge velocities averaged from 700 to 900 feet per second (270 m/s), depending on powder quality, charge and conical bullet weight. Combustibles were usually loaded with a special high performance sporting grade black powder, using the minimum charge required for a specified impact level, usually determined by pine penetration tests. 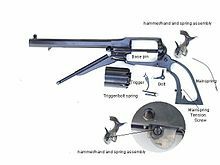 The special powder and minimal charge reduced black powder fouling, allowing revolvers to be fired as much as possible before cleaning was necessary. The Remington revolver owes its durability to the "topstrap", solid-frame design. The design is stronger and less prone to frame stretching than the Colt revolvers of the same era. The internal lockwork of the Remington is somewhat simpler in construction. While the Colt employs separate screws for the hand and trigger, those components share the same through-frame screw in the Remington design. A downside in the design of the 1858 is that that the barrel and receiver are a single piece, making it more difficult to clean the barrel, as it cannot be removed. Another innovative feature (first appearing in the 1863 Model production series) was "safety slots" milled between chambers on the cylinder. The milled slot positively secured the hammer between chambers for safe carry by placing the hammer's firing pin where it did not rest on a percussion cap, eliminating the risk of an accidental discharge if the gun was dropped or the hammer struck. Most 19th-century revolver designs lacked such safety features. Early Whitney revolvers, for example, were similar to the Remington but lacked the safety slots. It was possible to lower the Whitney hammer between cylinder chambers for safe carry, but without the Remington milled slot the Whitney cylinder could possibly slip and rotate, allowing the hammer to strike a loaded, capped chamber and cause an accidental discharge. The Remington revolver permitted easy cylinder removal, allowing a quick reload with a spare pre-loaded cylinder; this being an advantage over other revolver designs of the time. It is, however, unlikely that this was common practice during the period. Spare cylinders were not provided by the Army. In 1868, Remington began offering five shot metallic cartridge conversions of the revolver in .46 rimfire. Remington paid a royalty fee to Smith & Wesson, owners of the Rollin White patent (#12,648, April 3, 1855) on bored-through revolver cylinders for metallic cartridge use. The Remington Army cartridge-conversions were the first large-caliber cartridge revolvers available, beating even Smith & Wesson's .44 American to market by nearly two years. Due to the large volume of these pistols, individual gunsmiths also produced cartridge conversions (from cap and ball versions) in a variety of calibers such as .44-40 and .45 Colt. William F. "Buffalo Bill" Cody used an ivory-handled New Model Army .44, serial number 73,293, from 1863 until 1906, when he gave it to his ranch foreman with a handwritten note which said that, "It never failed me." In June 2012, the pistol came up for sale at auction and sold for a reported sum of US$239,000. The Heritage Auctions company represented the pistol as "The Most Important William F. "Buffalo Bill" Cody Gun Extant". Accompanying the sale of the pistol were personal artifacts of Cody's including seventeen handwritten letters. The various pistols in this series with pertinent data. A New Model Army replica made by Pietta. The Remington-Beals design lives on today in the form of replicas from Italian manufacturers Uberti, Pietta, and Euroarms; available in modern steel, and brass frame. The Euroarms and Uberti New Model Army replicas are nearly identical to the originals. These replicas are very popular in civil war reenacting and Cowboy Action Shooting. Several companies produce drop-in "conversion" cylinders for replicas, enabling the firing of low-pressure modern cartridges without altering the revolver's frame. These conversions, of course, being akin to the original Remington cartridge conversions used on the Western frontier of the 1860s and 1870s. The percussion cylinder can be used interchangeably. Due to the value and delicacy of the original revolvers, they are not recommended for modern shooting purposes. ^ a b Bequette, Roy Marcot ; edited by James W.; Gangloff, Joel J. Hutchcroft; foreword by Arthur W. Wheaton; chapter introductions by Richard F. Dietz; book design by Robert L. (1998). Remington : "America's oldest gunmaker". Peoria, IL: Primedia. ISBN 1-881657-00-0. ^ Earle, Otis; Zimmerman, Dan. "Gun Review: 1858 Remington". www.thetruthaboutguns.com. Retrieved 10 October 2014. ^ a b Flayderman, Norm (2001). "V-E "Remington Handguns"". Flayderman's Guide To Antique American Arms...And Their Values (8th ed.). Iola, Wisconsin: Krause Publications. pp. 137–142. ISBN 9780873493130. ^ Thomas, Dean S. (2003). "Federal Arsenals". Round Ball to Rimfire: A History of Civil War Small Arms Ammunition, Part Three:. Thomas Pubns. pp. 1–10. ISBN 978-1577470922. ^ Cumpston, Mike; Bates, Johnny (2005). "23, ""Shooting the 1858 Remington Army and Navy Revolvers"". Percussion Pistols And Revolvers: History, Performance and Practical Use. iUniverse, Inc. pp. 132 et seq. ISBN 978-0595357963. ^ a b Taffin, John (2006). Gun digest book of the .44. Northfield, Ill.: Gun Digest Books. p. 17. ISBN 978-0896894167. Retrieved 10 October 2014. ^ Marcot, Roy ; edited by James W. Bequette; Gangloff, Joel J. Hutchcroft; foreword by Arthur W. Wheaton; chapter introductions by Richard F. Dietz; book design by Robert L. (1998). Remington : "America's oldest gunmaker". Peoria, IL: Primedia. ISBN 1-881657-00-0. ^ a b Staff. "Lot 44094 The Most Important William F. "Buffalo Bill" Cody Gun Extant. ... (Total: 11 Items) 2012 June 10 Legends of the Wild West Signature Auction - Dallas #6079". historical.ha.com. Heritage Auctions. Retrieved 9 October 2014. ^ Fraser, Paul. "Buffalo Bill's Remington revolver achieves $239,000 at Heritage". www.paulfrasercollectibles.com. Retrieved 9 October 2014. ^ Flayderman, Norm (2001). Flayderman's guide to antique American firearms ... and their values (8th ed.). Iola, WI: Krause Publications. p. 146. ISBN 0-87349-313-3. ^ Butler, David F. (1971). United States Firearms: The first Century 1776-1875. Winchester Press. p. 208. ISBN 9780876910306.